A P-trap is a portion of pipe that attaches to the bottom of a sink and curves downward and then upward again before reaching the drain pipe. This bend creates a “trap” that always contains water. It is this trapped water that prevents sewer gases from rising through the drain at the bottom of the sink basin. P-traps also act as a catch point for small objects, which are inadvertently dropped into the sink. Fortunately, connecting a P-trap to a bathroom sink takes only a few minutes. Wrap the threads of both ends of the P-trap with Teflon tape to prevent leaks. 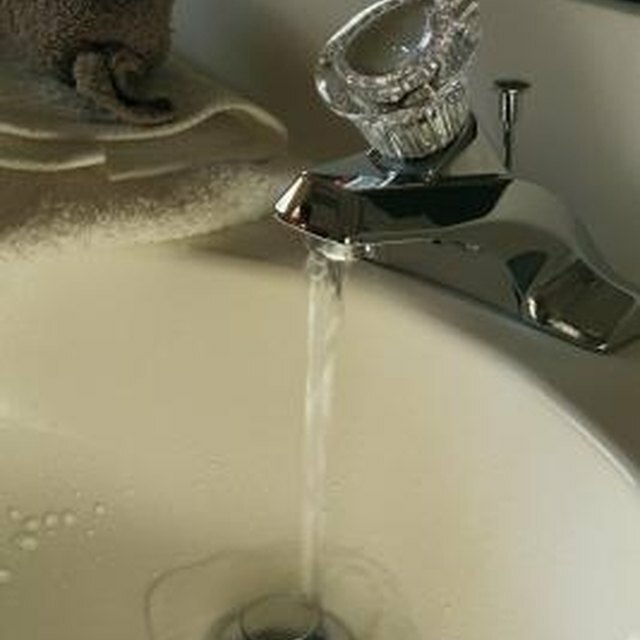 Slide a single slip nut onto the drain pipe that extends from the sink’s wall, followed by a single compression washer. The slip nut must be placed onto the drain pipe with the threads of the nut facing downward. Slide a single slip nut onto the drain pipe that extends from the bottom of the sink basin, followed by a single compression washer. The slip nut must be placed onto the drain pipe with the threads of the nut facing downward. Position the P-trap onto the two drain pipes. The shorter of the P-trap's two openings must be placed against the opening of the drain pipe that extends from the wall of the bathroom, and the P-trap’s longer tube must be placed against the bottom of the sink’s drain pipe. Slide the two compression washers to the end of their drain pipes, then slide the two slip nuts down their drain pipes until they reach the threaded ends of the P-trap. Hand-tighten the two slip nuts onto the P-trap. Tighten each slip nut a quarter turn with channel-type pliers, then turn the sink on and check both fittings for leaks. If leaks are present, tighten the leaky fitting a quarter of a turn at a time with the pliers until the leak stops. John Stevens has been a writer for various websites since 2008. He holds an Associate of Science in administration of justice from Riverside Community College, a Bachelor of Arts in criminal justice from California State University, San Bernardino, and a Juris Doctor from Whittier Law School. Stevens is a lawyer and licensed real-estate broker.